Generic drugmaker Sandoz announced plans Thursday to start selling an alternative to the EpiPen in the U.S. early next year. The name-brand injector has come under fire for rising prices and supply problems. The EpiPen injector is used to halt life-threatening allergic reactions to insect bites, nuts and other foods. Brand-name EpiPen, which dominates the market, has been in short supply since spring because of production problems. 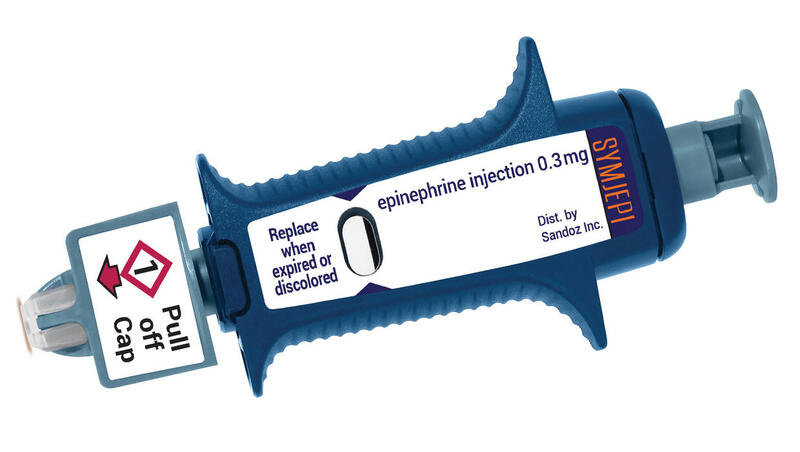 Sandoz will sell prefilled syringes with the same medicine, the hormone epinephrine, under the name Symjepi. The price will be $250 for two, without insurance. Two generic versions of EpiPen are sold in the U.S. for $300 a pair, including one from EpiPen seller Mylan. The company started selling its own generic after it was blasted for repeated hikes that pushed up its list price from $94 to $608 for a pair of brand-name EpiPens. What people pay varies, though, depending on insurance, discounts and the pharmacy. Mylan's injectors are made by a subsidiary of Pfizer, which is upgrading factories to fix quality problems. That resulted in production slowdowns. Pfizer said Thursday it's shipping some injectors and expects to ship more in the coming months. The shortages triggered temporary shortages of other similar products, including Auvi-Q. As a result, U.S. regulators let some manufacturers extend expiration dates. Parents were left scrambling to find devices for children with severe allergies, and CBS News reported earlier this fall that some even had to keep kids out of school until replacements could be found. Sandoz, part of Novartis AG., will sell syringes with an adult dose made by Adamis Pharmaceuticals Corp. A children's version will follow. Israel's Teva Pharmaceutical Industries began selling limited quantities of its new generic EpiPen in the U.S. last week. The Teva version was the first generic to win FDA approval. "This approval means patients living with severe allergies who require constant access to life-saving epinephrine should have a lower-cost option, as well as another approved product to help product against drug shortages," FDA Commissioner Scott Gottlieb said in a news release when the decision was announced in August.